This key research focus reflects the background, capabilities and specialisations of staff across the Bioscience Research Institute (BRI) in the domains of life and physical science specializing in Therapeutics Synthesis, Formulation, Processing and Drug Delivery, Diagnostics and Medical Devices. Global developments in the Life Sciences sector – the patent cliff, sectoral convergence, downward pricing pressures from purchasers and the shift towards personalised healthcare – are leading to an increasingly complex manufacturing environment for the sector. The need to bring products/treatments to market as quickly and cost effectively as possible must be managed in the context of requirements for efficiency, safety and quality control. Ireland is well placed to provide leading-edge manufacturing solutions that meet the evolving needs of the sector. However it must move its research higher up the value chain and position itself as a location to provide answers to research questions posed by the need to find novel therapeutic entities with druggable characteristics. This requires research into preformulation, toxicology and analytical chemistry strategies in order to be effective in advancing drug candidates. Given its critical mass of fine chemical and pharmaceutical related companies (Alkermes, Arran, PPD, Athlone Laboratories, Intertek, Freund to mention a sample) the Athlone/Midlands region is particularly heavily involved in fulfilling this mandate. BRI is positioned to work with the sector in its need to continue to invest in transformational change within pharma manufacturing and service oriented firms, building on Ireland’s international reputation for manufacturing and regulatory excellence by increasing the spectrum and level of R&D activity with a key focus on HEAs Research Priority Areas. Chemistry has a central role in science. Synthesis has a central role in chemistry. Analysis represents the interval for judgment on the success and merits of the synthetic effort. Pharmaceutical analytical chemistry can aid and inform the basic research, upstream development, and fine-tuning for synthetic processes, development pathways and delivery of finished products for marketing. Analysis also exists as an independent field for materials and environmental determinations. Its practitioners within the BRI seek to obtain quality data about pharmachemical systems to support quality decisions. Being so linked, it is appropriate that AIT should seek to combine these disciplines within the overarching framework of the Biosciences Research Institute. The importance of the pharmaceutical sector to Ireland’s future wellbeing has been frequently opined on. What is equally critical is that flexible and responsive higher education providers must entice and ultimately equip the graduate chemists of the future with the skill sets to adapt to the evolving resources and therapeutics paradigms. The focus of chemistry research is undoubtedly moving from structure to function not least in the pharmaceutical arena. The synthetic route enables us to add value to simple and abundant natural resources. Synthesis and analytical characterization are becoming more sophisticated, yes, but also inextricably linked. 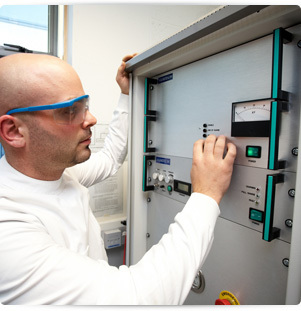 AIT has developed enhanced infrastructure and supervisory expertise in the fields of enzymatic kinetic resolution and stereoselective synthesis, structure-activity relationship evaluation, and surface recognition on the synthetic side, and this has complemented analytical activities in encapsulation and phase solubility, ultra-trace analysis and formulation development. These activities are integrated with approaches to improving the decision-making process in structural modification of drug candidates so as to enhance the pharmacophore while reducing toxicity. Mr J Roche, Dr A Stocca, Dr D Faller, Dr J Kennedy, Prof C Higginbotham, Dr C Donoghue. Dr S Reidy, Dr N Morris, Prof C Higginbotham. Mr J Roche, Dr C Donoghue, Ms D Lord, Dr A O’Malley. Mr J Roche, Dr E McCullagh, Dr S Reidy, Dr N Morris. Dr A Mulvihill, Dr C Brougham, Dr N Kinsella, Dr C Kealey, Dr C O’Donnell, Dr S Devery, Dr T Montgomery, Dr E McNeena, Dr A M O’Brien. Ms D Patterson, Dr E. Lane. Dr C Brougham, Dr D Eardley, Dr M Booth, Dr A Friel. Dr C O’Donnell, Mr J Roche, Ms C McCormack. Dr C Brougham, Prof N Rowan, Dr E Lane, Dr J Hayes. The pedigree of research activities to date has seen publications and conference presentations across a spectrum of peer reviewed journals and leading edge platforms such as the Journal of Medicinal Chemistry; International Journal of Analytical Chemistry, The Royal Society of Chemistry’s Analytical Research Forum, The Royal Pharmaceutical Society of Great Britain’s British Pharmaceutical Conference, The International Meeting on Cholinesterases and The World Congress of Environmental Biotechnology. Research projects are frequently linked with enterprise and are also aligned with core strategic needs identified by the National Strategy for Higher Education 2030 (2011). Publically-funded research projects have been facilitated through various bodies including Enterprise Ireland, Health Research Board and Science Foundation Ireland Programmes, along with EU FP7 Programmes. The track record underpinning research excellence in these disciplines can be traced back to a lineage of undergraduate provision in Analytical Chemistry which started as a Level 7 offering in 1982. Since the mid-2000s, following input from key stakeholders such as an Industrial Advisory Board and international colleges who consistently send us students for one to two years, AIT re-branded these programmes as Pharmaceutical Sciences. See Click here This Level 7 & Level 8 provision will continue to feature core analytical and synthetic modules to ensure a supply of competent graduates. We would like to acknowledge the assistance of Share Biotech, The Minister and Department of Community, Environment & Local Government, The EU and EAFRD in part-funding this project.